When Patrick first wrote about the Diamond Jubilee edition of the Naparima Girls’ High School Cookbook back in September, I most certainly agreed with his assertion that it is the “One Cookbook to Rule them All”. Like him, I’ve got a reasonably well-worn copy of the culinary tome in my kitchen, which I turn to frequently to satisfy my cravings for a taste of home. In my experience, I had never come across a Caribbean cookbook to match it… That is, until you, our faithful Uncommon Caribbean readers, encouraged us to get our hands on the book pictured here. This is the current version of the Naparima Girls’ Cookbook that you can find in just about any half-decent bookstore in Trinidad & Tobago. Think it’s the same as the ’87 version? Think again! The words “updated” and “revised” on the front cover are not just there for show – this is an extensively upgraded edition in just about every way. The initial difference is evident directly on the cover, which now features a vibrant photo depicting typical fruits and vegetables used in West Indian cooking. The image presages the wonderful collection of full-color images of various dishes found throughout the book. I don’t know about you, but having a photo of the finished product sure helps me when I’m trying to whip up something, especially for the first time. The new images provide a useful visual aid… and a mouth-watering enticement. Another big difference: nutritional information is now listed for each and every dish. This is obviously a tremendous plus for those of us trying to be more careful about our calories. When you realize that eating Flying Fish will net you 654 calories (289 from fat!) per serving, it’s pretty easy to opt for Saltfish Buljol‘s paltry 125. Great photos and nutritional info aside, the latest edition of the Naparima Cookbook retains the original version’s comprehensive and exhaustive representation of every single culinary tradition found in the West Indies, with some popular recipes from overseas thrown in for good measure. 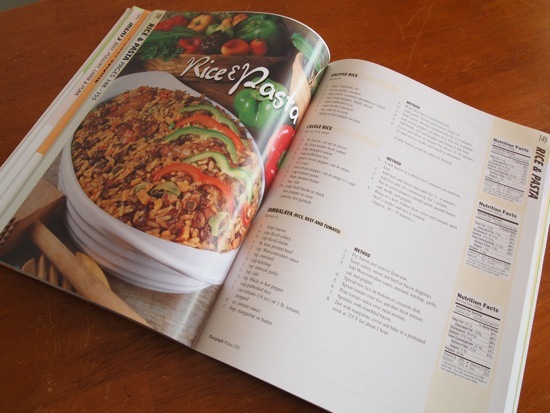 The book contains more than 500 recipes covering everything from fish and seafood dishes, meats, soups and vegetarian cuisine, to beverages and cocktails, candies and desserts, jams, jellies, pickles, preserves and more. There are even special sections dedicated to microwave and diet recipes. Basically, if you can eat it or drink it and it has origins in the Caribbean and it tastes good, you’ll find a recipe for it in this book. Now, if you’re interested in purchasing the Naparima Cookbook, you’ll also find that Uncommon Caribbean is the best place online where you can do so. You may find it elsewhere, but you won’t find a better price than what we’re offering. And why not? After all it was you, our readers, that turned us on to the idea of offering the books for sale in the first place. Last updated by Steve Bennett on 04/30/2012 . Fantastic Friday goes down each year on the Friday immediately preceding Ash Wednesday and the height of Trinidad Carnival on Carnival Monday and Tuesday.